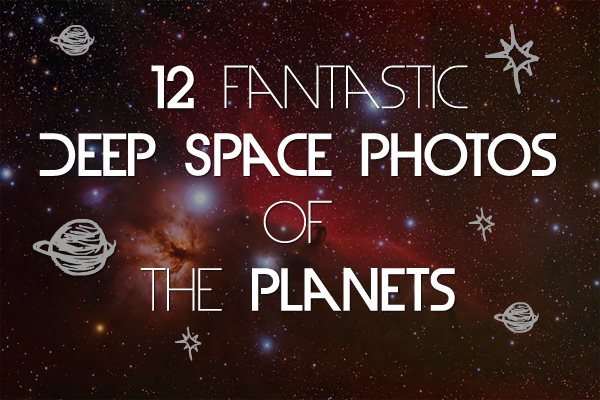 Some of the greatest human achievements have been the missions to explore the planets in our Solar System, and these endeavours have also produced some of the most important and visually stunning images in the history of photography. This post brings together a showcase of some of the best planetary space photos starting with Mercury, the closest planet to the Sun, and working our way out to the very edge of the Solar System. 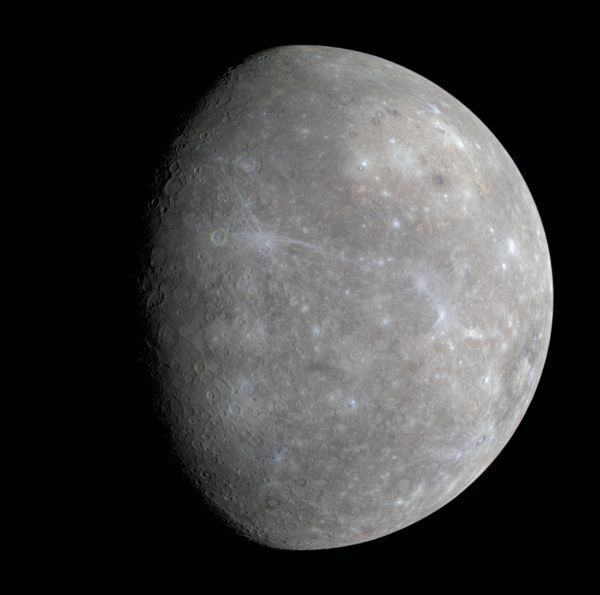 This photograph reveals craters and impact basins on the surface of Mercury’s, the Solar System’s smallest planet and the closest to the Sun. The image was captured by MESSENGER, a robotic spacecraft sent by NASA in 2004 to collect and study scientific data about the planet. This stunning image taken by NASA’s Solar Dynamics Observatory spacecraft captures the 2012 transit of Venus, with the planet revealed as a small black disc passing across the dynamic inferno of the Sun’s surface. 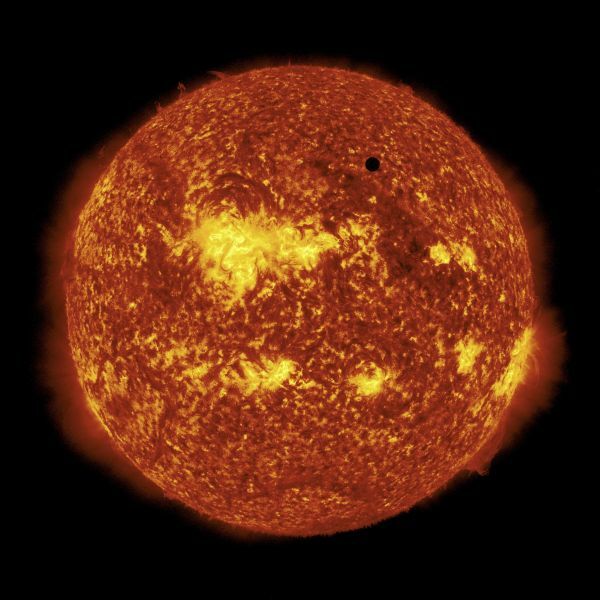 The transit of Venus occurs when the second-closest planet to the Sun passes in front of the star as seen from the Earth; the transit occurs in a pattern of 243 years with two transits eight years apart and then a long gap between another pair of transits – the next pair of transits will occur in 2117 and 2125. 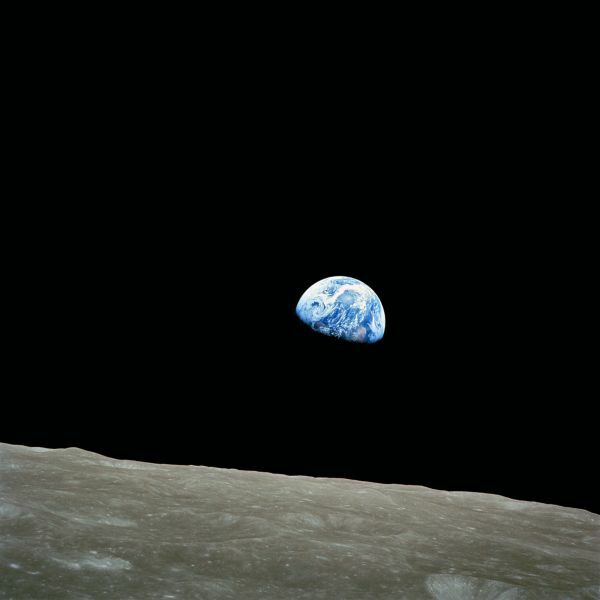 The Earth is the third planet from the Sun, and since the development of space exploration in the 20th Century photographers have had the opportunity to turn the camera back towards our home planet. A beautiful photograph which is a composite mosaic of Mars, the fourth planet from the Sun, created from data recorded by the Viking 1 orbiter which visited the planet in 1980. 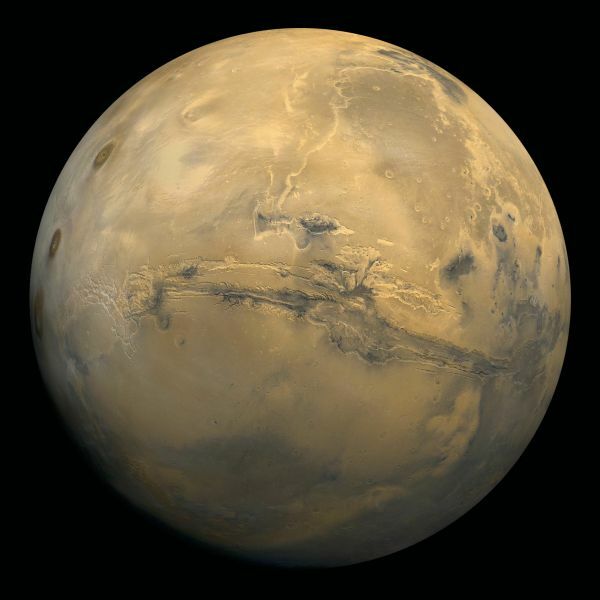 The scar-like geographical feature across the centre of the planet is Valles Marineris, which, at 4,000 km long, is one of the Solar System’s largest known canyons. The Voyager 1 space probe captured this amazing photograph in 1979 as it passed 5.7 million miles above Jupiter, showing the giant planet’s turbulent clouds of gas. 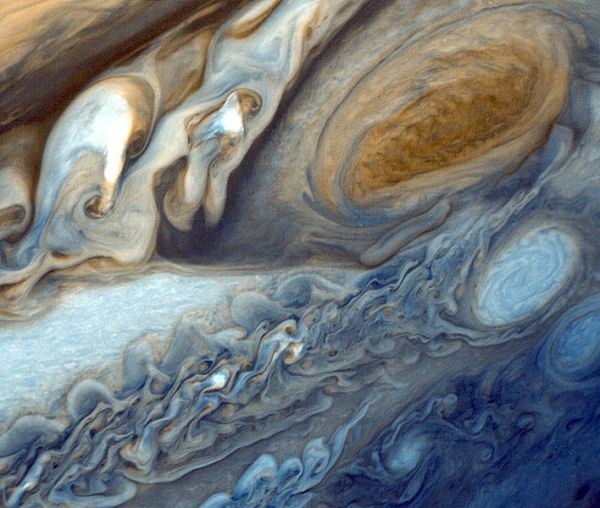 The Great Red Spot is actually a colossal storm three times the size of the Earth! It has been raging for hundreds of years. The Voyager program is a space mission with two probes, Voyagers 1 and Voyager 2, which NASA launched in 1977 to explore Jupiter and Saturn, the outer Solar System, the heliosphere – the layer that surrounds the Solar System – and, eventually, to travel into deep interstellar space. 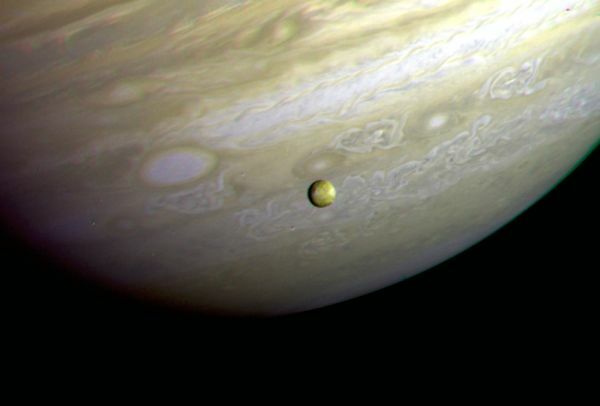 In 1979, Voyager 2 captured this image in which we see Jupiter’s moon Io in transit above the planet’s surface. Although it looks tiny compared to Jupiter, it is actually the fourth-largest moon in our Solar System and is believed to possess over 400 active volcanoes! This makes it the most geologically active object in the Solar System. 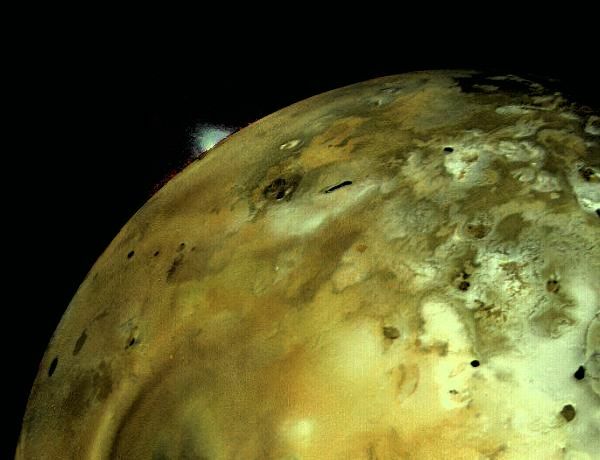 On March 4th 1979, Voyager 1 made its closest pass to Io as it explored the Jovian system and recorded this landmark image of a volcanic explosion on the moon’s surface. After visiting Jupiter and the Jovian moons, the Voyager probes continued their journey onwards to the sixth planet from the sun, Saturn. Voyager 1 captured this image as it passed 5.3 million kilometres from the planet and its distinctive rings – the camera is aimed back at the Sun so the shadows and perspective reveal the awesome scale of the rings and their spoke-like features. Titan is Saturn’s largest moon and one of the most intriguing places in the Solar System. The moon is composed of water ice and rock, has a nitrogen-rich atmosphere, a climate with seasons and surface features thought to be similar to those found on Earth. The Cassini–Huygens spacecraft launched on a mission to Saturn in 1997, reaching the planet and its moons in 2004. 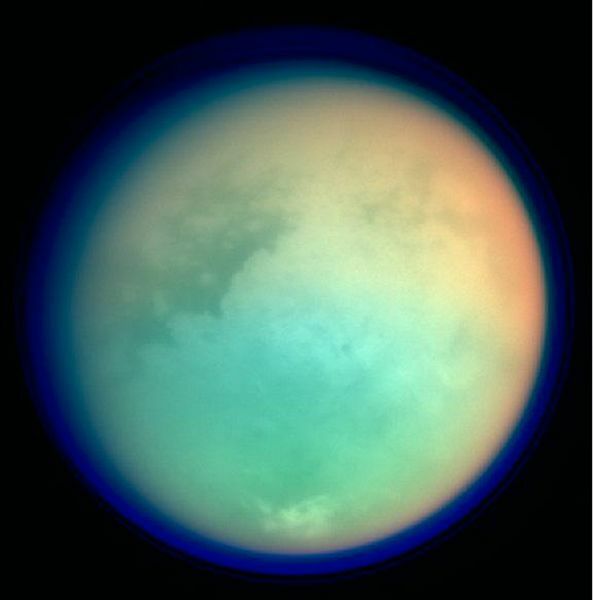 This image of Titan recorded by the probe reveals that the moon’s atmosphere is hundreds of kilometres thick and may help protect the surface from harmful solar winds. 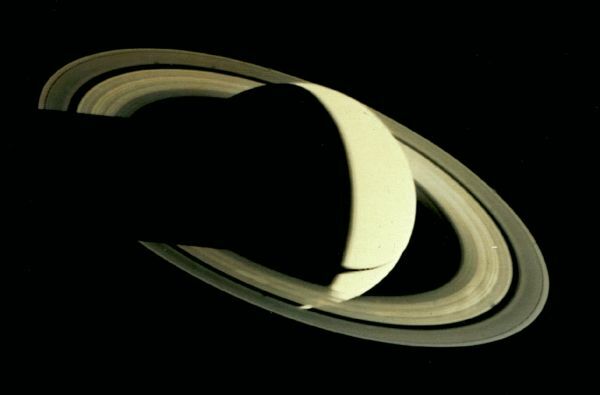 After leaving Saturn, Voyager 2 continued its mission to Uranus, the seventh planet from the Sun. 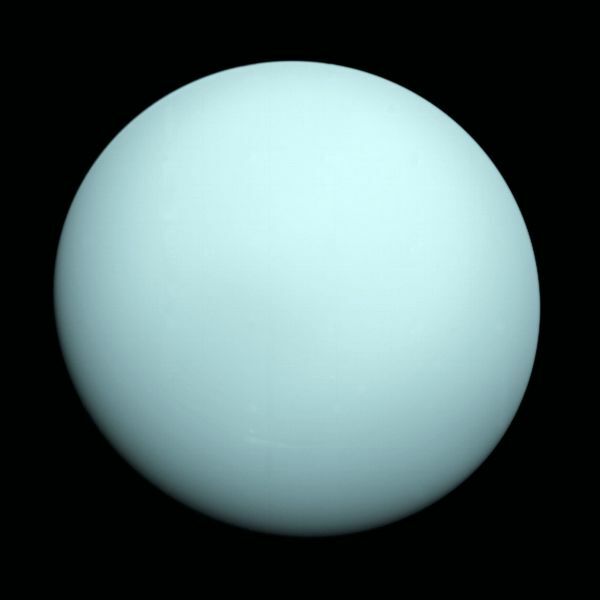 The probe encountered Uranus in January 1986, capturing this eerie image. The planet has an unusual axis which is pointed almost directly at the Sun, so the planet has extremely long seasons with each pole alternating between 42 years of direct sunlight and 42 years of complete darkness. 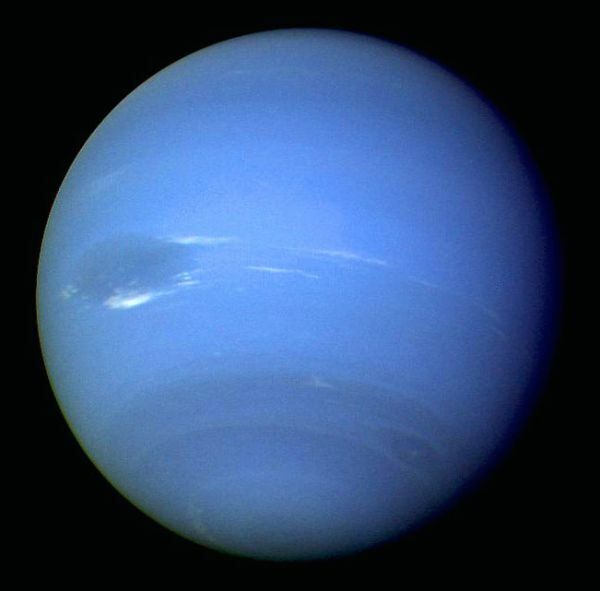 Voyager 2’s next destination after Uranus was Neptune, reaching the eighth and farthest planet from the sun in August 1989. The probe discovered the ‘Great Dark Spot’ which is visible on the planet’s surface in this photograph from the mission. The spot is thought to have been a hole in the clouds that envelope the planet; recent observations by the Hubble Space telescope suggest the feature has now disappeared. In 1990, 12 years after its launch, Voyager 1 had completed its primary role of exploring Jupiter and Saturn and their moon systems and the probe was heading into deep space for the next stage in its mission. At the request of cosmologist Carl Sagen the probe turned its camera back towards the centre of the Solar System and took this picture entitled ‘The Pale Blue Dot, which is arguably one of the most important images in the history of photography. 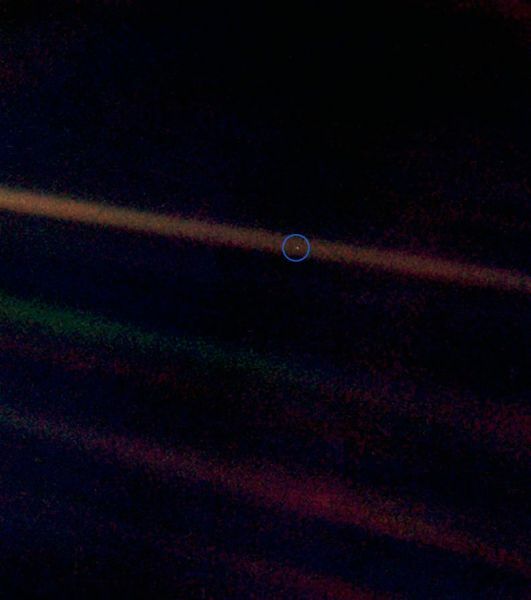 In the image we see the Earth from a distance of 6 billion kilometres (3.7 billion miles), our home planet appearing as a tiny blue speck in the vast darkness of space. Voyager 1 and 2 continue travelling in the Heliosheath and send scientific information back to us, with Voyager 1 currently the furthest human made object from the Earth. The probe is on the brink of leaving the Solar System, the first human made object to do so. About the author: Alex Morris is a writer and researcher for Cartridge Save where we sell ink cartridges in Manchester, England. He’s fascinated with space and always keeps an eye on NASA’s latest developments whilst remaining very firmly stuck on Earth. The current Mars Curiosity Rover has also been providing fascinating photography!